- AMMO SUPPLY WHAREHOUSE WILL NOT ship AMMO TO ANYONE UNDER 21 YEARS OLD. Also, you must be 21 years old to reserve ammo for a front sight class. Please refer to the "HOW TO BUY AMMO" page for details. Will Ammo Supply Warehouse, LLC ship to my location? 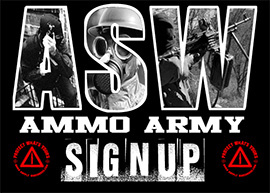 - AMMO SUPPLY WAREHOUSE SHIPS TO ALL 50 STATES!!! We typically utilize UPS GROUND for orders to the lower 48 states, however we have been HAZMAT approved, so we can now ship to all 50 states using UPS 2ND Day Air. Hawaii and Alaska must use the UPS 2nd Day Air service. IL, MA, CT, and NJ residents will need to provide a copy of your Firearm ID Card (or equivalent). Please email a copy of your FOID card (or equivalent) to info@ammosupplywarehouse.com after you have placed your order to ensure that there is no delay in shipping your items. If you do not have the required documentation, please do not place an order. It is up to you to make sure you are not violating the law, so please consult an attorney or your state attorney general if you have any questions or concerns. Remember you are responsible for your actions, so please make sure you are certain you can legally possess what you are ordering. You assume all responsibility for the order, legally and financially, if your order is held by law enforcement or any other agency, because you were not permitted to receive ammunition. No orders will be shipped outside the continental US. How will I know that my order has been placed and when will it be shipped? - Our shipping department works as follows: After placing your order on the website, both you and ASW will get an email confirmation of your order. Please ensure that you have entered your email address into the shopping cart correctly. Our system is completely email driven, so if your email address is wrong, you will not receive any of the appropriate order documentation. We pack and process the order for shipment. Your package information is then sent to UPS for pickup, and at that EXACT MOMENT AND NO SOONER, your tracking number will be generated and emailed to you by UPS. You will receive that tracking number email in your email inbox, but sometimes folks find it in their spam or trash folder (please check). As a courtesy, we ask that you please do not email or call us asking if your package has been shipped. Rest assured we are working tirelessly to fill your order, and when your package has been shipped, you will receive the tracking number via email. Depending on volume, our packages usually ship within two full business days. So if you do not see an email with tracking number a few days after placing your order, that would be an appropriate time to inquire about your order. It’s not that we don’t want to entertain your questions, but everyone asking if their order has shipped prevents us from processing as many orders as we can to maintain our timely service record. I would like to cancel my order, what can I do? - If your order has not left our warehouse, your payment will be refunded, minus a 10% CANCELLATION FEE. That may be waived at our discretion. Please do not put us in that position, and BE SURE OF YOUR ORDER BEFORE CLICKING THE SUBMIT BUTTON. We will be happy to cancel your order, but know that it takes us REAL time, effort, and money to cancel an order…even if your order was placed just minutes ago. What is Ammo Supply Warehouse, LLC return policy? - Once ammo leaves our facility there is no returns for any reason. Please RE-READ the above question. If your order is delivered and not correct, CONTACT US IMMEDIATELY, and we will work to ensure your satisfaction. Your happiness is imperative to us, so if we have made a mistake, please allow us the opportunity to correct it. I live locally, can I pick up my ammo? - YES. Please just give us a call and we will accommodate your needs as best as we can. Pick- ups are strictly by appointment only. Remember to bring a valid ID to prove your age. How soon in advance should I reserve my ammo for a Front Sight™ class? - As early as you like, however 14 working days prior to class is the norm. If you feel the need to reserve a month in advance, knock your socks off and place your order. IT WILL BE HERE WAITING FOR YOU. Once I have ordered for an upcoming class, how do I get my ammo? - When coming into Pahrump, please give us a call to arrange pick up at our location or we can talk about a delivery to the local hotels in town. Pick-ups are strictly by appointment only. We WERE meeting folks out at the corner of Tecopa Rd. and RT. 160, but evidently someone did not like having competition out there. These same folks, after urging the BLM to “do something” about us, caused the BLM to try to fine us, and ultimately inform us that we could no longer sell out at that location. It seems monopoly. Interesting. What forms of payment does Ammo Supply Warehouse, LLC accept? - Payment over the internet on our secure website using a visa, MasterCard, or Discover. We DO NOT accept American Express, sorry. Pre payment by mail: use a certified bank check, postal money order. Please allow enough time for the payment to get here and us to process it before attempting to pick up your order. Usually seven working days will be sufficient. We will not ship your order until payment has cleared. On site pick up: We prefer cash, but also accept Visa, MasterCard, or Discover. - We also accept pre 1964 American silver coins, authentic silver, platinum, palladium and gold bullion. Call Ammo Supply Warehouse at (775) 513-1058 for details.